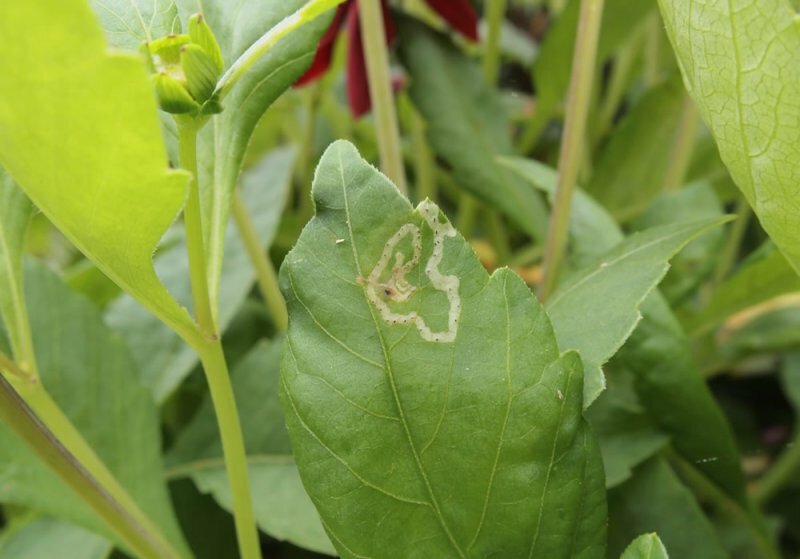 Small white spots, followed by sinuous white tunnels (‘mines’), appear on the leaves of outdoor plants in May/June and in late summer, or anytime on plants grown indoors. Where there are several mines in a single leaf they can appear to join together as one mass and be confused with symptoms of the chrysanthemum blotch miner. The adults are dark coloured flies, about 3mm long, which have a light grey patch on their thorax. They fly between plants and pierce the leaves with sharp, tongue like organs called ‘ovipositors’. They use this method to feed on sap and also to lay eggs (singularly) in the leaf, each female depositing up to 100 eggs in total. The spots where the ovipositor was inserted often appear as small white spots, which can be confused with chrysanthemum white rust disease. The eggs hatch after about a week and then the creamy-white, legless larvae tunnels into the leaf, producing the tell-tale mines, feeding on the leaf tissue. As the larvae grows (it reaches 3 to 4mm in length) the mines get larger, and they generally head towards the mid-rib of the leaf. After 2 to 3 weeks of feeding the larvae pupate within the mines, during which they can be seen as small, dark bumps on the lower leaf surface at the end of a mine. The adult emerges from the pupa after around 10 days (longer at lower temperatures). The breeding cycle only occurs in the summer outdoors (where there are usually only 2 generations), but may continue all year indoors. The mines are unsightly and, in the case of a severe attack, the leaves may be so extensively mined that the plant wilts and dies. Plants with smaller leaves are more prone to severe damage. Affects cultivated plants of the Asteraceae family including chrysanthemums, cinerarias, calendulas, leucanthemums and lettuces, plus weeds such as groundsel, dandelions and sowthistle. Ensure that weeds which can host the pest are removed, particularly groundsel, dandelions and sowthistle. Exercise good garden hygiene, particularly collecting and destroying fallen leaves. 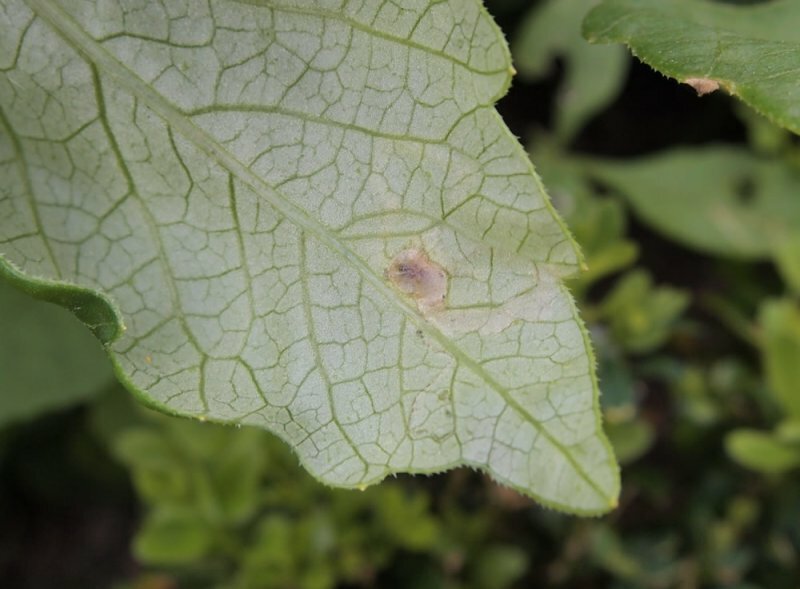 As soon as you see the small white spots (puncture marks from the adult’s ovipositor) or mines appearing pick the leaf off and destroy it (not on your compost heap). A systemic insecticide, containing thiacloprid or acetamiprid, should be effective if used in the larval stage. Biological controls (such as the parasitic wasps Dacnusa sibirica or Diglyphus isaea) may help to control glasshouse infestations. A similar problem is caused by the American serpentine leaf miner, Liriomyza trifolii, however the mines of this pest are more likely to contain frass and are less white in colour. They also tend to be less linear (the mines of Chromatomyja syngenesiae are more likely to broadly follow the direction of the leaf margin towards the mid-rib).